We provide a comprehensive range of strategic, practical and technical consulting solutions from management consulting to operations training and support, supported by our expertise in Food and Beverage. management consulting and training solutions to the Food and Beverage industry. We design and build strategies and systems to help solve some of the most complex and interesting business challenges in the Food and Beverage industry. We specialize in restaurant opening along with the opportunity to work with businesses already operating yet facing distress in restaurant management. From concept planning to operational setup and restaurant launch, we will hold your hand through every step. 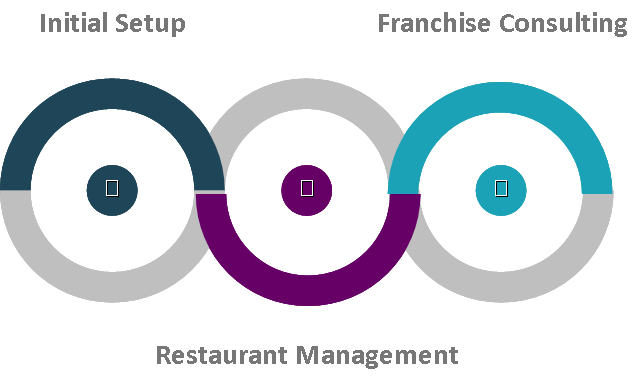 We can help you avoid that costly learning curve that most people go through when venturing on a new restaurant launch. We draw from our experience, expertise, and contacts to help new entrepreneurs embark on their dreams. Business owners who require diligent oversight of their restaurant and their business, our depth of experience and collaborative management style will help you achieve your goals. We will work closely with the management to document the process, procedures and guidelines that are key to consistent operations and communicates your business’ critical information to your management and employees. We can create and implement a training program for policy and procedure manuals, operating systems, operations and recipe manuals, and all position training manuals. We are dedicated to understand and meet the operational needs of each client. We offer comprehensive operational support, so that our clients can conduct their Food and Beverage businesses with confidence. We provide customized strategies designed to maximize your strengths, to work within your available resources, and seize available opportunities to achieve your specific objectives. We provide the finest professional service for developing a franchise business in the highly competitive Food and Beverage market. Our franchise consulting services include operational review, development of operation and procedure manuals, development of franchisee training programs and manuals, and corporate development and restructuring of existing franchise in order to pinpoint areas of strengths and weaknesses. Once problem(s) have been diagnosed, we provide wholistic solutions that focus on factors revolving around the main problem(s) and also strengthen areas where a strong foundation has already been set, rather than fixing the problems only.